FACT CHECK: Did Donald Trump Appoint Sarah Palin as a Science Advisor? 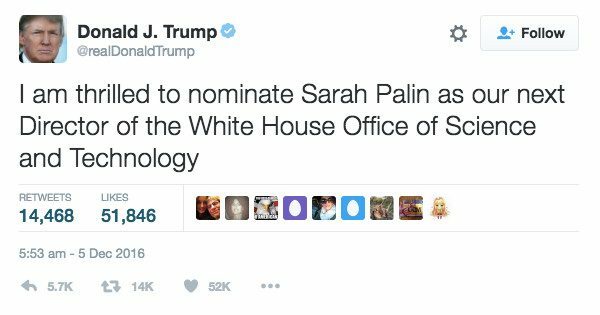 Did Donald Trump Appoint Sarah Palin as a Science Advisor? A report that President-elect Trump appointed the former governor of Alaska as a Science and Technology Advisor is a fake news tidbit. President-Elect Donald Trump appointed Sarah Palin Science and Technology Advisor. This tweet did not appear in Twitter’s history of Trump’s account, and no other news outlet reported what would have been an undoubtedly highly newsworthy appointment. That lack of additional coverage is because this report originated with World News Daily Report, a fake news site. The site used an old and unrelated image of Donald Trump and Sarah Palin together (which dated to 2011) to suggest that the pair had met during the President-elect’s transition period in late 2016.